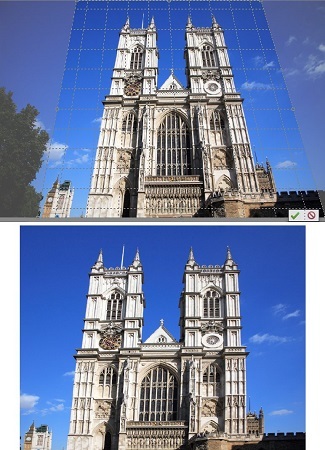 In either Expert mode, select the Perspective Crop tool from the Tools panel. You can also press the C key until you get the tool, which shares a space with the Crop and Cookie Cutter tools. Draw a marquee around the distorted image by clicking at each corner. Adjust the edges and corners of your marquee as needed. You have some options to choose if desired. Width (W) and Height (H): Enables you to specify a desired width and height to crop your image. Resolution: Specify a desired resolution for your cropped image. As with the Crop tool, try to avoid upsampling your image. Grid: Toggle the view on or off of a grid of intersecting horizontal and vertical lines over the image. You can also just press Enter or click the green Commit button next to the marquee. To cancel your crop, click the red Cancel button. Elements should improve the keystone distortion and crop your image. If you’re not happy with the result, choose Edit → Undo and tweak the angle of your marquee in Step 3. It may take a few tries to get the results you want. The Perspective Crop tool crops while correcting keystone distortion.